The Heart of Kent Hospice care for people with a terminal illness in our local community. Whether at home, or in the Aylesford based Hospice, they support patients, their families and carers to come to terms with their diagnosis, and are privileged to support their patients to live in comfort, with independence and dignity through their illness and to the end of their lives. Virtual running is a simple concept that does a lot of good for charity. 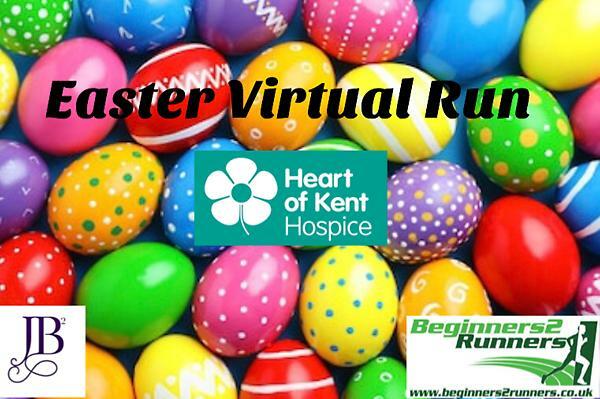 30% of the profit form each medal will be donated to the Heart of Kent Hospice - please see their website https://www.hokh.org for some more information about the charity. Let’s really get behind this amazing charity that has touched so many of you. You will need to complete the 5K between Friday 19th April and Monday 22nd April. Record your run/walk or jog on your phone, watch, treadmill etc and then take a screen shot/photo of your runs an send it to us with a picture of your colourful clothing and friends. When you have completed your run email the proof to virtualproof@beginners2runners.co.uk - No proof sent, no medal! Last date to submit proof is Friday 10th May which is when the medals will start to come out. After that no further proofs will be accepted and no medal will be sent we have a strict no excuses, no refunds policy so the charaties do not miss out. You must only send proof via the email, Facebook post or messgaes will not be accepted. Once we have received your proof we will dispatch your medal to your B2R Club of choice or post out depending on your choice of delivery option. So enjoy a challenge, earn yourself a fab medal and help an amazing charity at the same time.